I recently stumbled across a fantastic photo archive at the Minnesota Historical Society, and I've been jamming my Facebook page with its images of long-gone Twin Cities buildings and street scenes. The comments from my Facebook friends have been encouraging, so I keep diligently posting them (today's pictures were of the former John W. Thomas department store at 8th St. and Nicollet Av., which was replaced by Midwest Plaza, and the former Semple-Hill warehouse complex at 1st St. and Nicollet Av., lost to the Gateway redevelopment). Then it occured to me: the Star Tribune has a pretty impressive photo archive too, one that is unfortunately not available to the public. I've done a little digging, and have stumbled across some memory-jogging images, many of them taken by photographers Roy Swan and Dwight Miller, who spent some serious time in 1960 making a visual chronicle of the streets of downtown Minneapolis. 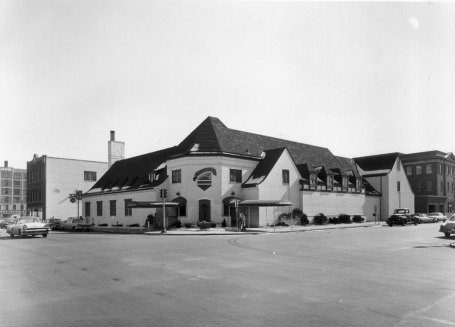 The photo above is the former Charlie's Cafe Exceptionale, 7th Street and 4th Avenue South in downtown Minneapolis, in 1960. The restaurant closed on July 21, 1982, after a 49-year run. It was, for many years, the city's most talked-about dining establishment. What are your Charlie's memories? Here's mine. Unfortunately, I don't recall ever dining there (I was a college student when the restaurant closed), but even now, almost 30 years after owner Louise Saunders pulled the plug, whenever I hear anyone mention the words "Charlie's Cafe," they are almost always immediately followed by "potato salad." My dad was just talking about it a few weeks ago. That's a powerful food memory. Here's the recipe, or at least a facsimile of it. Note: This recipe must be prepared in advance. "Many recipes have floated around for Charlie's 'exceptionale' potato salad," wrote Linda Koutsky and Kathryn Strand Koutsky in "Minnesota Eats Out: An Illustrated History" (Minnesota Historical Society Press, $34.95). True, including several versions published in Taste (it was the readers' most requested recipe for more than 20 years). A 1989 iteration, part of a Taste 20th-anniversary celebration, led Charlie's owner, Louise Saunders, to quickly rebuke its veracity and that of its predecessors. "[ Saunders] said the time has come to stop using it, 'because the recipe is incorrect,'" wrote Star Tribune reader representative Lou Gelfand a few days after it was published. Saunders insisted that not only were the true ingredients known only to her and to two others, but that the salad was always prepared in stages, which prevented employees from devising -- and, presumably, stealing -- the coveted formula. (I recall stumbing across a story in the Strib archive that mentioned one of the "secret ingredients," which was the juice from a canned fruit cocktail, but this could be my memory playing tricks). This version, blessed by Saunders (she died in 2003), was composed by longtime St. Paul Pioneer Press food writer Eleanor Ostman for "Minnesota Eats Out.." We re-published it in Taste on Dec. 24, 2009. To prepare mayonnaise: In a blender, combine egg yolk, mustard, sugar, salt, cayenne pepper and 1 tablespoon lemon juice or vinegar. Blend at medium speed, adding oil in a thin stream until mixture thickens. Add remaining lemon juice. Makes 1 3/4 cups. To prepare salad: Place diced potatoes in a large bowl and sprinkle with salt and pepper. Gently mix in green onion, red pepper and eggs. Stir in about 1 1/4 cups dressing, adding more if needed ( Charlie's was a very creamy potato salad) and mix gently. Cover with plastic wrap and chill at least 2 hours before serving.